The International and European Federations of Journalists (IFJ-EFJ) have today renewed calls for the release of Ukrainian journalist Roman Sushchenko on the anniversary of his arrest by Russian authorities on spying charges. The IFJ/EFJ backed the demand of their affiliates, The National Union of Journalists of Ukraine (NUJU), the Independent Media Trade Union of Ukraine (IMTUU) and Russian Union of Journalists (RUJ) for his immediate release and the condemnation of the charges against him. Working for Ukrainian news agency Ukrinform for 14 years, Sushchenko had been the agency’s correspondent in France since 2010. He was arrested on 30 September last year while he was on leave, after having flown to Moscow for private reasons. The journalist was arrested the day he arrived and detained in Moscow’s Lefortovo Prison without the Ukrainian embassy or his family having been informed. On 7 October 2016, he was charged with conducting ‘espionage’ in Russia. The Russian security service (FSB) accused him of working for the Ukrainian Defence Ministry’s Main Directory of Intelligence. Since October, Russian courts have extended Sushchenko’s detention in two or three month increments. The latest extension is up to November 30 2017. 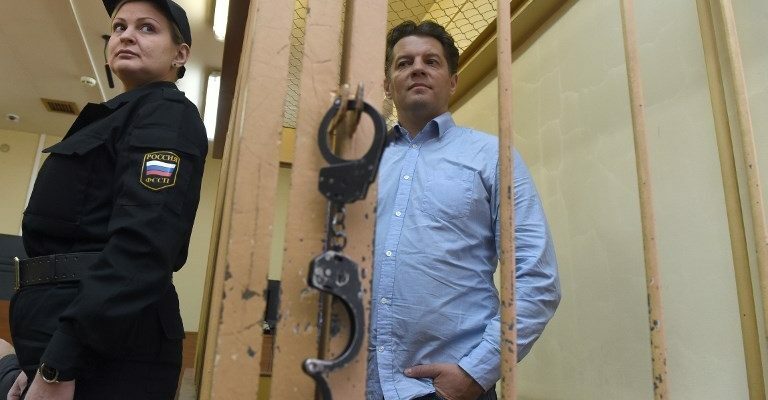 Ukrinform expressed outrage over the charges levelled at Sushchenko, calling them “spurious” and called on the international community to help secure his release. “Roman is a respected professional journalist with a strong reputation” said Sergiy Tomilenko President of NUJU. “Hopefully widespread attention to the obvious absurdity of the ‘espionage’ case can help Roman go free”. IFJ General Secretary Anthony Bellanger said: “One year on Roman’s continued detention is an affront to media freedom. We urge the authorities to free Mr Sushchenko immediately”. Mogens Blicher Bjerregård, EFJ President said, “We believe that the charges against Roman are completely fabricated for the sake of silencing his critical voice. The authorities must release him immediately”. Picture credit: Vasily Maximov / AFP.